Fill in your order and fax/email it to us for early processing and delivery. Visit and Like our 40-Days Fast & Prayer Facebook page. The Malaysian church and the nation have entered the year 2014 with unprecedented challenges. One of the many ways the church can respond is to travail and persevere in prayer. 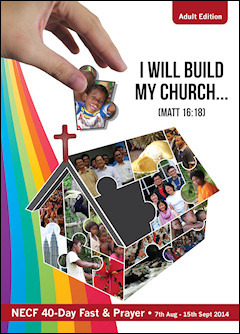 The theme of this 14th edition of the 40-day Fast & Pray booklet echoes the word of our Lord Jesus, "...I will build My church..." (Mt 16:18). This booklet has been prepared to encourage the Malaysian church to draw near to God, abide in His word and purify our hearts that we may partner with our Lord in the building of His church so she may truly be a blessing to the nation. The order form for the booklet is available for download on this page. Kindly fill in your order and fax/email it to us for early processing and delivery. Let us come together to pray and seek the Lord to see His church be built.